When your plane begins making its final descent from 30,000 feet (9,000 meters), you think the worst is over. Then, mere minutes before reaching the landing strip, the whole plane shudders as something heavy smashes into the wing. It's not a bird; it's not another plane. It's a drone — a tiny but nevertheless powerful object that can turn from a toy or a tool to a piece of devastating midair shrapnel in seconds. "While the quadcopter broke apart, its energy and mass hung together to create significant damage to the wing," Poormon said in a statement. As you can see in the high-speed video Poormon and his team recorded, the tiny, 2-lb. (0.9 kilogram) drone disappears into the wing like a bullet into butter (yeah, we googled it). 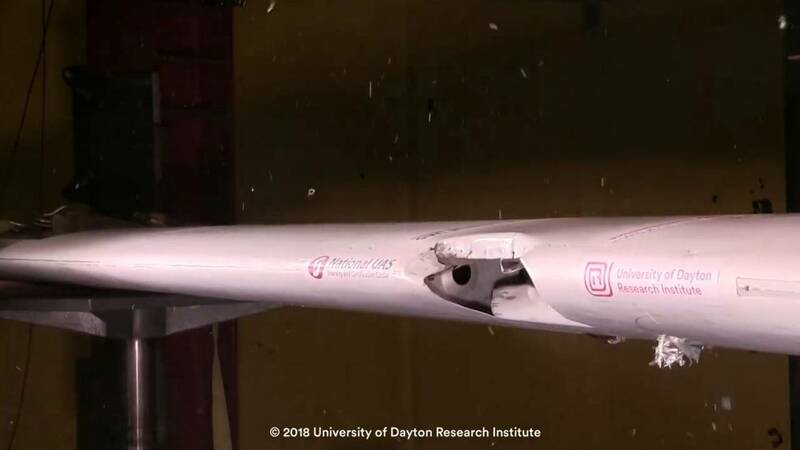 The shattered drone ripped open the wing's leading edge, burrowed inward and damaged the wing's spar — a key structural element that keeps the wing stable. In comparison, when the team shot a fake bird made of pink gel out of their cannon, it ruptured a wider hole in the wing's leading edge, but left the spar untouched. "All the weight of the aircraft is suspended on the spars," Poormon told Wired. "If you damage the spar enough on that side, you would not survive. The aircraft would crash." The wing in Poormon's impact experiment came from a Mooney M20 aircraft — a small, general use airplane that seats about four people (including the pilot). While these relatively small craft aren't built with the same safety specifications of a large passenger jet, the thickness and structure of Mooney wings are pretty similar to those on a larger commercial plane, Poormon said. And as drones become more and more mainstream, the chances of a disastrous collision occurring grows ever greater. According to a Federal Aviation Administration (FAA) report, pilots reported coming in close proximity to nearly 800 unmanned aerial vehicles between April and June 2018 alone. Those sightings have resulted in a few close calls, and at least one significant collision; In New York last year, a civilian quadcopter flying at about 300 feet (91 m) smashed into an Army Black Hawk helicopter, obliterating the drone and denting the helicopter's rotor. While the FAA has rules about where and when you can fly a drone legally, most accidents — including the Black Hawk collision — probably occur because drone pilots are unaware that they're breaking these rules. Increased UAV regulation could help prevent future accidents, Poormon said, as could an effort to manufacture drones in such a way that makes them more likely to shatter on impact. World's fastest delivery drones are saving lives. Here's how.